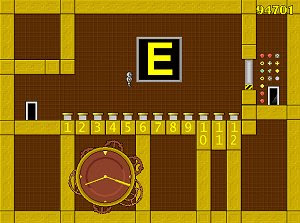 Treasure Tower is a fast-paced platform game written in Clickteam’s Multimedia Fusion, featuring over 200 rooms in 26 individual courses. The objective of each course is to climb a tower and collect the treasure at the top. The main enemy of the game is time, which is shown by the large clock in each of the rooms. It has to be kept replenished by finding food before midnight is reached, otherwise the game is over.